I enjoyed another great night of racing at New Egypt Speedway tonight. With bad weather approaching, there was a sense of urgency in the air, and they managed to get the show completed in about three and a half hours. 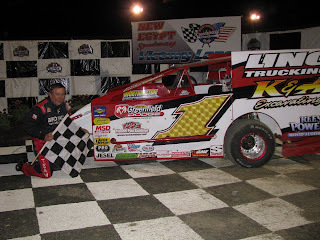 Billy Pauch won the Modified feature in dominating fashion after Rick Laubach suffered an uncharacteristic spin while running mid pack. Rick fought back to finish 10th I think. For complete results go to http://www.newegyptspeedway.net.